Rosacea is an chronic inflammatory skin disease chracterized by facial redness, bumps and pimple-like blemishes that affects about 14 million Americans, mostly women. In our image-conscious society, the detrimental impact of rosacea goes far deeper than the obvious physical effects. According to the National Rosacea Society, more than 76 percent of rosacea sufferers report that their skin condition has lowered their self-confidence and self-esteem, and many of them even avoid public contact or cancel social engagements. To help those with rosacea look their best and radiate with confidence, well-known style and beauty expert Charla Krupp shares her tricks of the trade to conceal this often embarrasing skin disease. Rosacea is a chronic skin disorder primarily of the facial skin that typically begins after age 30. It is characterized by redness of the cheeks, nose, chin or forehead that tends to become ruddier and more persistent as time goes on. People with rosacea may experience times of remission as well as flare-ups. Even though the skin disease may go into remission on its own, if left untreated, bumps and pimples can develop and, in severe cases, the nose may grow swollen and bumpy from excess tissue. Often mistaken for acne, skin allergies or excema, rosacea is not a condition that people can outgrow; rosacea has no cure. Although rosacea can affect all segments of the population, individuals with fair skin who tend to flush or blush easily are believed to be at greatest risk. Women also tend to be at more risk for rosacea than men, but men tend to suffer the more severe effects. In addition to the physical effects of this chronic skin disease, rosacea sufferers also suffer an emotional toll — the condition is so emotionally damaging, it can lead to depression and low self-esteem. Findings from a survery conducted by the National Rosacea Society (NRS) reveal that 58 percent of respondents with rosacea said that they would be willing to modify their lifestyle by giving up shopping or eating out at restaurants for six months or longer, if it were possible to get rid of their rosacea forever. While there is no cure for rosacea and the cause is unknown, medical therapy is available to control or reverse its signs and symptoms. Individuals who suspect they may have rosacea are urged to see a dermatologist or other knowledgeable physician for diagnosis and appropriate treatment. To help lessen the detrimental impact that this skin condition has on self image and self esteem, women can use beauty products to their advantage. Charla Krupp, The New York Times bestselling author of How Not To Look Old, has teamed up with the NRS, pharmaceutical company Galederma, and dermatologist Dr Hillary Baldwin to raise awareness of rosacea. Krupp and Dr Baldwin are part of the Rosacea Relief Squad, a section featured on the website BestFaceForward.com, a practical online resource for those with rosacea. Krupp’s lifestyle tips include simple ways to tame rosacea triggers, as well as make-up and wardrobe recommendations that can minimize the appearance of rosacea. In addition, Dr Baldwin shares practical, everyday advice for rosacea sufferers and explains how a dermatologist can help those with rosacea keep their condition in check. 1. Prime your canvas. As a first step in applying makeup, Krupp advises trying a primer with silicone that smoothes over wrinkles and pores and creates a gentle barrier between your skin and other make-up. “Not only will your skin look more flawless, but it can also help lessen the chance that other makeup will irritate skin with rosacea,” the beauty expert explains. 2. Use the right tools. Use a brush rather than a sponge. Sponges are more difficult to clean than brushes, and with rosacea, having clean make-up and applicators is super important. 3. Think dewy. Use a gel or cream foundation, concealer and blush, suggests Krupp. These formulations are so much more moisturizing than powder, which can settle in fine lines and on top of flakiness on the skin, making it seem more pronounced. 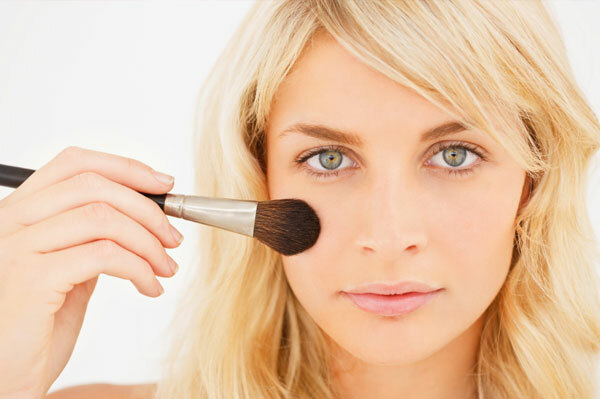 Powder can also contain coarse particles that can irritate sensitive skin with rosacea. Do you think you have rosacea? Be sure to check out Is it acne or rosacea?